QUESTION: Mr. Armstrong; I tried to search to see if the Romans ever issued any coins to announce the victory over Masada. I did not find any mention of Masada and coins whatsoever. I assumed if anybody knew it must be you. Were there any coins to commemorate that event? ANSWER: No. The battle for Masada was necessary politically. The Judaean War was already declared to be a victory with the destruction of the Temple and conquest of Jerusalem in 70AD. Masada fell three years later in 73AD. The Roman governor of Judaea, Lucius Flavius Silva, headed the Roman legion X Fretensis and laid siege to Masada. The Tenth Legion was created by Octavian in 41/40BC and was created during the Civil War at that point in time. The Tenth Legion was very distinguished for it was named after the Tenth Legion formed by Julius Caesar and its symbol was that of a bull which was the holy animal of the goddess Venus, which was supposed to be the goddess of the Julian clan. The Tenth Legion fought against Sextus Pompey but later it also fought with Octavian against Marc Antony and Cleopatra. Flavius Silva wanted a truce. But there were factions in the Roman Senate that used Judaea as a political tool of power against the new emperor Vespasian (69-79AD) who had won the Civil War after Nero’s death. Like the press today who seem to be begging for war by constantly painting Russia as the enemy, the exact same process was taking place in Rome. This forced Vespasian into going after Masada. They were using the Jews as a sign of weakness just as CNN uses Russia against Trump today. It was the political opponents of Vespasian who forced him to deny a truce and to lay siege to Masada. The press in the USA also created the Spanish-American War. Today, we have CNN leading the charge to create World War III because their champion Hillary lost the election. 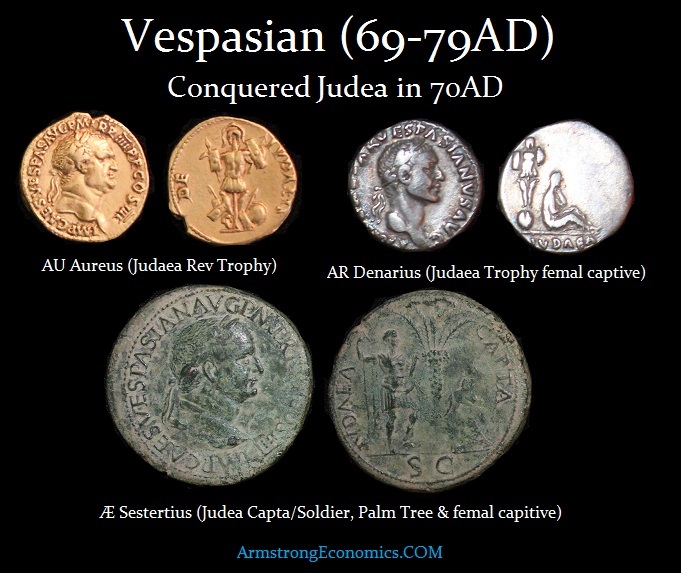 You will find Vespasian coins in all metals announcing the victory over Judaea in 70AD. There were no coins to proudly announce the victory over Masada three years later. The only coins you can attribute to the siege of Masada are bronze coins of the former Emperor Nero (54-68AD) counter-stamped with “X” which was Legion X that was stationed in Judaea during the conquest. These two coins counter-stamped “X” are quite rare. They obviously cannot be prior to Nero and the coins were not new when counter-stamped. Legion X Fretensis and V Macedonica were sent to Alexandria, Egypt in 66AD in preparation for an invasion of Ethiopia planned by Nero. However, both of these legions were diverted to Judaea to suppress a revolt that was beginning on a large scale. Following the death of Nero in 68AD, another civil war broke out. Vespasian was then compelled to go to Rome the following year where he seized power. His son, Titus finished the suppression of the revolt in Judaea. Legion X Fretensis remained in Judaea and completed the siege of Masada. Therefore, these coins counter-stamped “X” must be post-66AD and that places them in Judaea. Consequently, the only coins that we can attribute to the possible siege of Masada are those of Nero counter-stamped “X” for Legion X Fretensis. 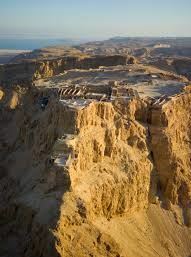 I have been to Masada and I climbed it rather than taking the cable car. It sits at the base of the Dead Sea. By the time I reached the top, I looked like Moses. My hair was pure white filled with the salt that is carried by the wind over the Dead Sea. My hair was so thick, I could not even get my fingers in it at all.